Bread and butter pickles are Raven's favorite pickles and I love them too. A girlfriend and I had a bread and butter war a few years ago and yours truly won. How you may ask???? 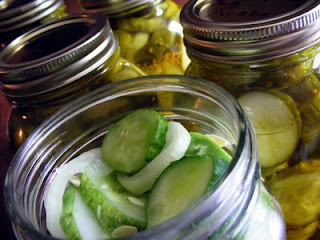 I know the secret to a crisp bread and butter pickle. Want to know my secret??? Ice and salt, that's it. You MUST ICE YOUR SLICED CUCUMBERS AND ONIONS DOWN WITH KOSHER SALT. If you do this I promise you will have crisp bread and butter pickles. This is What's Cookin on Beaty's Creek today. Wash and slice cucumbers and onions. Let stand 3 hours in the ice and kosher salt. Now mix vinegar, sugar, spices and heat until hot, drain cucumbers and onions and then pack into hot jars. Pour enough syrup in to cover cucumbers and seal. Process in a hot water bath for 12 minutes. Let pickles set for about 2 weeks before eating.